I was already on edge Wednesday night, after the close encounter with the traffic fatality earlier in the day, so the blood-curdling wail that arose in the darkness beyond the bedroom door to the deck easily startled me out of bed. It was around 10:30 p.m. and the mysterious cry that began surprisingly similar to the sound of our teapot on the stove actually had me questioning how the water could possibly be boiling at that hour. The distressing shriek just kept going like a siren, causing both Cyndie and me to climb out of bed to investigate. I grabbed a powerful spotlight that I keep next to the bed for just such occasions, and scanned as far and wide as limitations of view allowed. There was no sign of any activity, even as the suffering victim continued to scream. It was chilling. There was no pause for a breath. I was wishing the predator would just finish the job and end the misery. It lasted somewhere between one to two minutes long. I strained to get a sense of the distance, or any other identifying impressions. The sound seemed to move away and then come closer. I wondered if it was airborne. Did an owl grab something? What would react to attack by emitting such a piercing cry? I didn’t trust my senses enough to feel confident about the apparent movement. Maybe it was just resonating in a way that made it sound like it was flying around. Since it was carrying on for so long, I had time to step outside for a better vantage point. Are you kidding!? I wasn’t about to expose myself to whatever savage beast was out there in conflict mode. Well, actually that’s exactly what would have happened, since I was “dressed” for bed at that hour. But what I mean is, I wasn’t going to put myself at increased risk by stepping outside into the darkness, not having a clue what was out there. When the sound finally ceased, we climbed back under the covers and I pretended I could fall asleep, despite the rambling thoughts of what the heck just happened outside. Soon we were both wondering out loud about what animals, both the predator and the prey, were most likely responsible. I asked Cyndie to give the area out back an extra search in the morning to look for tracks or signs of a fight. She found no evidence whatsoever. George was over for dinner and cribbage last night and he suggested that the screaming was probably a rabbit, and the attacker could have been a coyote or fox. That I believe as easily possible, but if they were under our deck, I don’t know how they got there without leaving tracks somewhere. 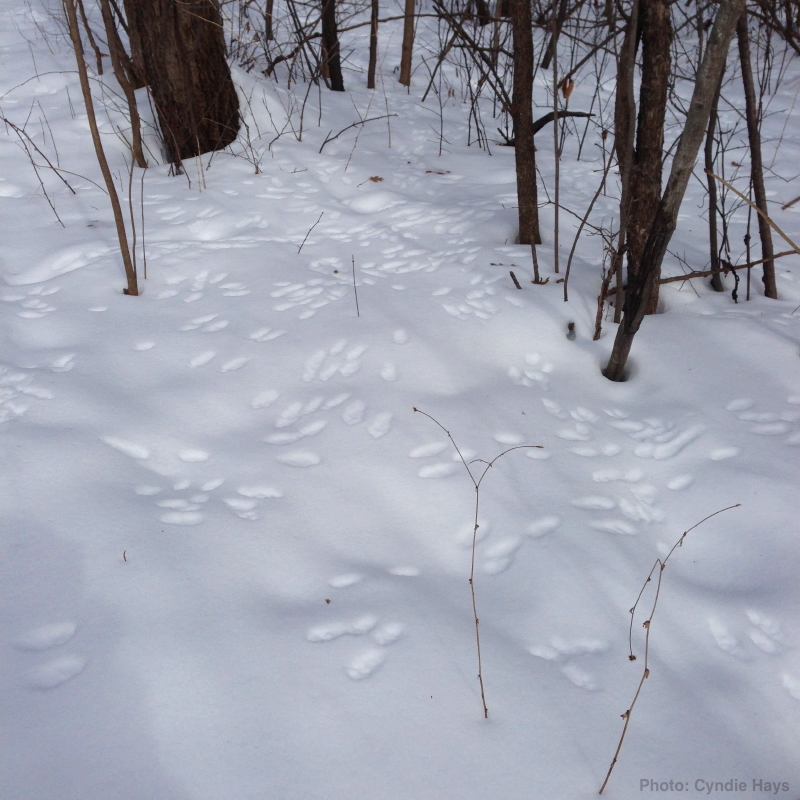 The rabbits are plentiful around here and Cyndie did find a super-highway of their tracks in our woods. She took this picture for me to use. We’ll have to watch that spot and see if there are one less sets of footprints showing up from now on.